Labour party leader Jeremy Corbyn has been forced to deny that he used the term 'stupid woman' during a heated debate in the House of Commons yesterday. Many news outlets claim that their lip readers have confirmed that he did use the term 'stupid woman' while some lip readers have taken to twitter claiming that the opposite is true. Prime Minister Theresa May said "I think that everybody in this house, particularly in this 100th anniversary of women getting the vote, should be aiming to encourage women to come into this Chamber ... and should therefore use appropriate language." Corbyn was asked to return to the house to apologise, but instead took the opportunity to insist "During prime minister's question time today, I referred to those who I believe were seeking to turn a debate about the national crisis facing our country into a pantomime as 'stupid people'. Mr Speaker I did not use the words 'stupid woman' about the prime minister or anyone else." 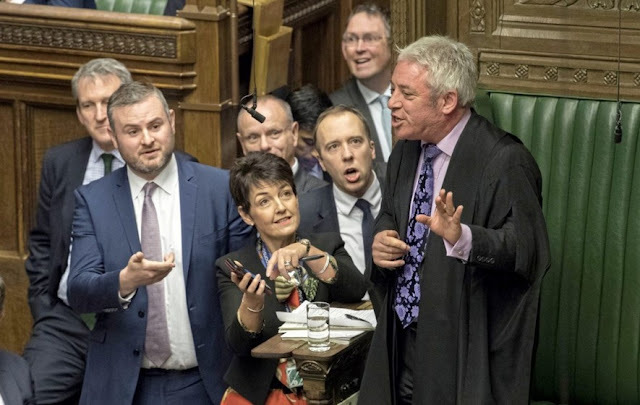 Speaker of the House John Bercow said of the matter "Nobody can be 100% certain, that includes professional lip readers. But I will naturally take, and would be expected to take, the word of any right honourable or honourable member. It's reasonable to expect the House to do the same." Tory MP Desmond Swayne said that criticising what Members of Parliament may utter under their breath was moving into "the realm of thought crime".